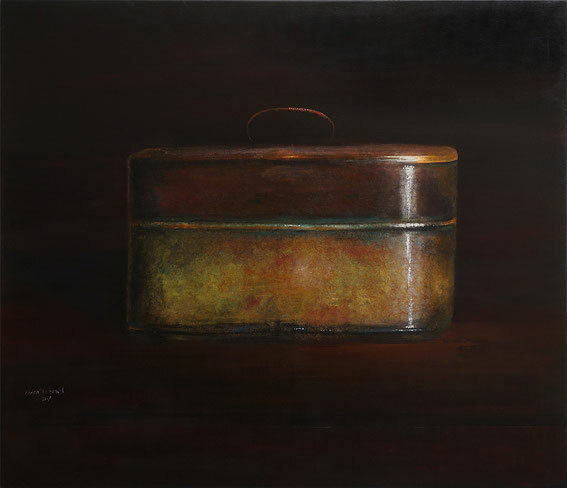 In dream interpretation, the suitcase stands for a journey; it is a symbol for endless change. It tells stories and is subject to permanent renewal. To me, it reveals the hidden depths of myself and challenges me to explore my inclinations and interests, talents and spirituality. My pictures are shaped by my personal history. After leaving my home country of Iraq, I realized that my home is my suitcase. As a nomad I find my home everywhere. When I touch my suitcase, I am magically connected to events in the past and to the people who left their traces. Formerly, the word “Baghdad” was associated with the oriental atmosphere of odors and aromas. My art allows me to return to the culture of my childhood, to the mystical world of thousand and one nights, incense, oriental clothes, living spaces and architecture. In the fourth millennium BC, Mesopotamia, the land between the Euphrates and Tigris, was inhabited by the Sumerians. This people lived in a fertile plain under harsh climatic conditions. Mesopotamia was the cradle of different civilizations that developed, among other, mathematics, astronomy, medicine and linguistics. The Sumerians and their Semitic successors were highly intellectual which is particularly notable in their art of writing which was revolutionized by the Sumerians around 2700 BC. Two Gulf wars and their consequences for the world order have profoundly influenced our world vision in recent decades. Also arts were affected; the focus veered away from pure esthetics. A war always leads to the death and suffering. After the end of the Iraq war in 2003, many historic art objects were destroyed in Baghdad and throughout the country with its rich history. The National Library was devastated by a fire, and the poorly secured National Museum was looted. Among other things, documents proving the origin of the robbed objects were lost. Fortunately, some of the looted objects from the oldest civilizations of humanity - Sumerians, Babylonians and Assyrians - have since reappeared at art auctions or were obtained from private collectors.